Thanksgiving is a grand affair at any American home! What if the kids could add value to the festival with some of their thoughtful crafts? 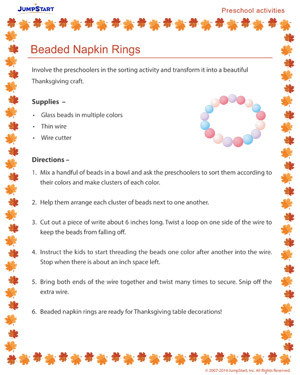 While you plan the grand Thanksgiving meal with your partner, sit the kids down with the craft supplies and have them make wonderful little napkin rings for the table that will host the grand feast! Besides, this exercise will make a wonderful sorting activity for the kids too! Check out all our free, educational activities when this one’s done.